Exeter Golf and Country Club offers the best welcome in England – it’s official. It’s just been named as the winner of England Golf’s Most Welcoming Club of the Year Award, sponsored by HowDidiDo. 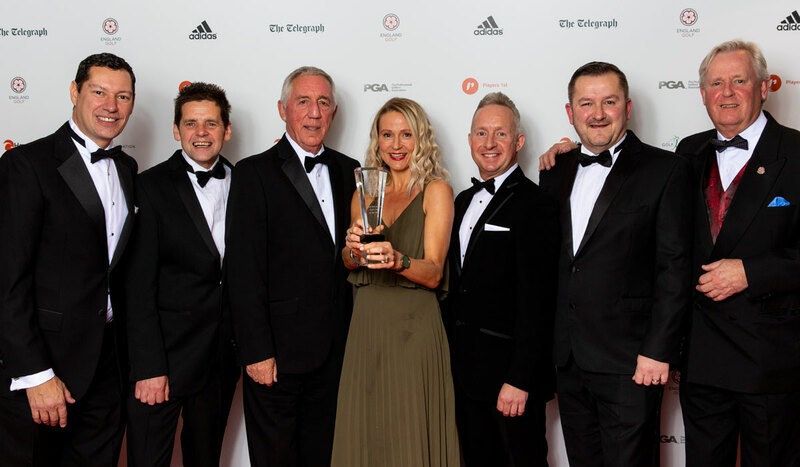 The Devon club’s success was applauded by over 400 guests at last night’s England Golf Awards, sponsored by adidas Golf, at the Royal Lancaster, London. They heard how the judges were won over by the way the club has blended the best of tradition with contemporary style to open its doors and appeal to golfers of all ages. Over recent years the club has taken positive steps to open its doors to both golfers and non-golfers, who can enjoy the swimming, spa and racquet sports. The result is that there’s a waiting list for men’s golf membership and a thriving women’s section, which is reaping the benefits of a recruitment campaign, and a growing junior section. The Saturday competitions attract entries from around 180 players. There’s a members’ app, buddies to help new members settle in, free membership for the over-85s to keep them playing and, new for 2019, the Topsham Academy which combines an eight-bay floodlit driving range with short game practice facilities. The club is also looking to the future with refurbishment plans to make it even more welcoming. Exeter representatives (pictured) was presented with the award by Richard Peabody, Managing Director of Club Systems, publishers of HowDidiDo (left).